To make up for yesterday’s debacle, I decided to forego the breakfast sandwiches in the freezer and instead head out to somewhere that specializes in breakfast sandwiches – Dunkin’ Donuts. 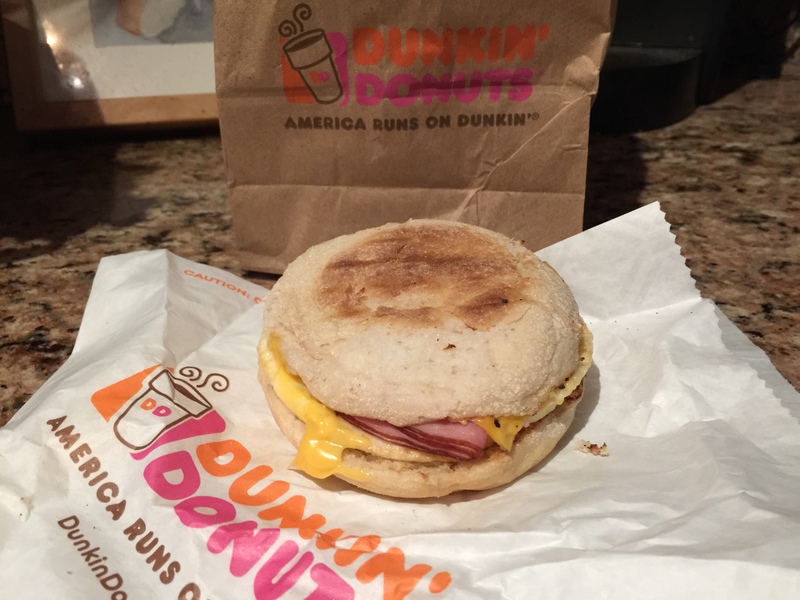 In fact, I wanted to see how Dunkin’s ham, egg, & cheese would compare to yesterday’s from Smart Ones. When I pulled the breakfast sandwich out of the bag, it was not sliding all over the place and falling apart like yesterday’s out of the microwave. The English muffin was warm and soft, and the entire sandwich was scrumptious. Now it’s not home cooking, but for fast food it’s good, and a great choice to replace bacon in a pinch. I guess that’s why Dunkin’ keeps American running. Another ‘hump day’ during Lent. 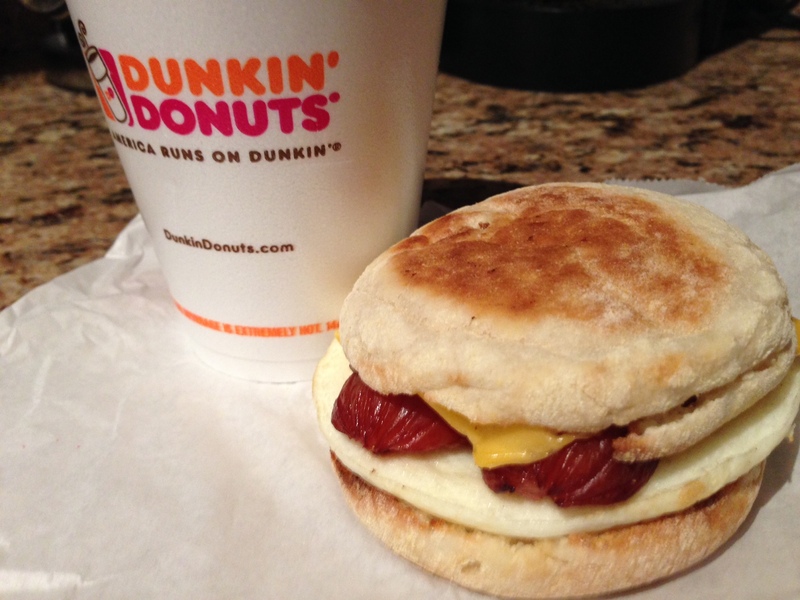 As I pondered what breakfast meat to go with today, I thought of this awesome breakfast sandwich that Dunkin’ Donuts came out with a couple years ago – smoked sausage on Texas toast. It burst with flavor… thick, juicy, savory… whoa – starting to sound like Penthouse Letters in here. Nevertheless, I decided to venture out to the ol’ DD to find out if they still served the smoked sausage – and lo-and-behold…. It’s a Thursday. Which means I can’t eat meat Friday. And now the “no bacon” thing is really kicking in! What can I do today that satisfies my bacon craving? Then I remembered an old friend – Dunkin’ Donuts. 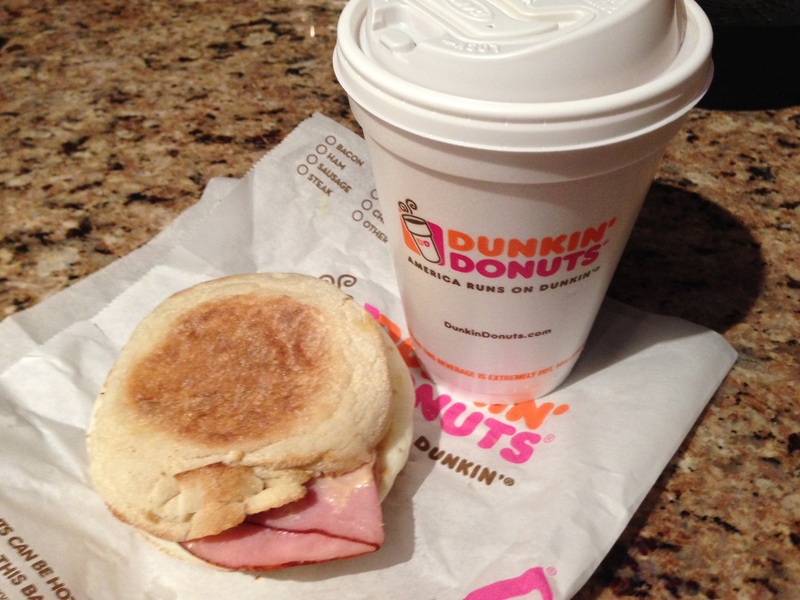 I ventured to my local store to peruse the menu, and I found something new – the Dunkin’ Donuts Eggs Benedict Sandwich! You may say that Eggs Benedict contains Canadian bacon, but I didn’t give that up – I call that “ham”. 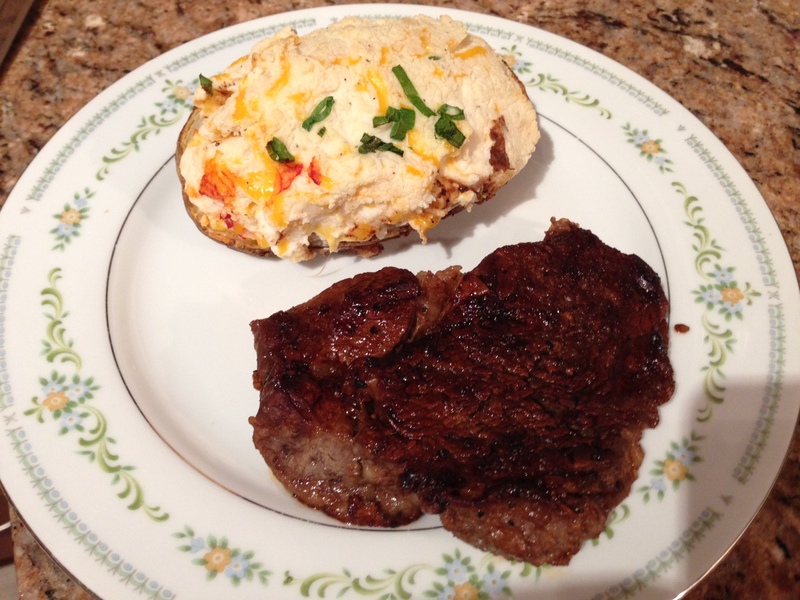 Oh, to get through the whole “no-meat” thing tomorrow, my awesome girlfriend picked up a couple steaks and stuffed baked potatoes. We ended up splitting one of the steaks – a rib eye. Hopefully that’ll get me through Friday. My half of the rib eye steak. Meat for dinner!